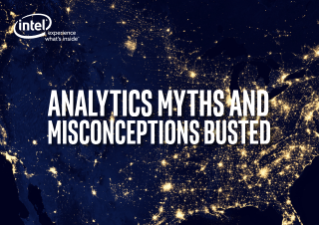 Learn about 6 common analytic myths, and see how you can leverage your existing infrastructure and workforce while you build your analytics strategy. Truth: You can actually start on the familiar Intel® technology-based ...infrastructure you already have and scale from there. There’s no need to make large up-front investments. Truth: All businesses need analytics, no matter what size they or their industry are. What’s important is understanding the key business issues within your own organization and exploring how advanced analytics can help you solve them. Truth: It will – you just need to make sure your data is organized, trusted, secured, and manageable. There are methodologies and tools available to help you do this. Truth: You can find or build analytics talent within your organization, and provide employees with applications that can turn them into a workforce of citizen data scientists. Truth: Measuring for measuring’s sake won’t get you very far. Start with a defined business problem and use that to set your measurable objectives and key performance indicators. Truth: You can use your existing IT workforce to scale your analytics capabilities. Use your Intel® technology-based platforms for enhanced scale, cost efficiency, and flexibility to support your business’ progression to advanced analytics.